ALL HANDS, PAWS, AND HOOVES ON DECK! Los Angeles, CA – All hands, paws, and hooves on deck for an adventure on the most famous boat of all time! 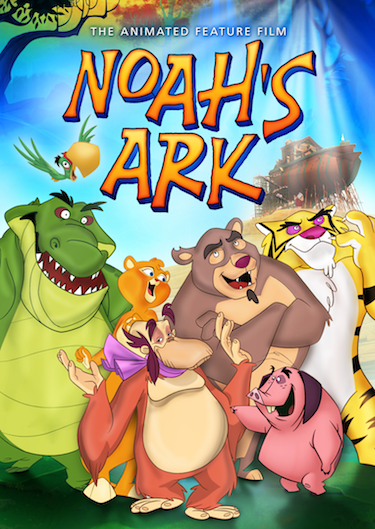 Award-winning filmmaker Juan Pablo Buscarini’s Noah’s Ark presents the classic story as a fresh and funny animated retelling that the entire family will love, and it will be released on DVD in the U.S. and Canada by Shout! Factory on March 11, 2014. Based on the Bible story by the same name, Noah’s Ark journeys to biblical times to as it tells the familiar tale of Noah, his family and the animals who traveled in the ark to survive an epic flood meant to destroy the rest of civilization. This animated movie takes a lighter approach to this traditional material, as the story is mainly told from animals’ perspective, and both animals and humans can speak. Noah is building a whale of a boat in order to save two of every species from a flood that will cover the entire world. Pretty soon, animals are lining up to board the Ark two by two. But as the rain begins to fall outside, it soon becomes clear that living together on a very cramped ship isn’t going to be easy! Trouble begins to brew when the animals begin to get hungry, a pair of stowaways plot to take over the ship, Dagnino the Tiger wants to replace the irresponsible Lion, Xiro, as king of the beasts and Noah’s own family begins to squabble! One thing’s for sure – it won’t be smooth sailing on this trip. But with a little luck and a little faith, Noah will be able to deliver his floating zoo to safety.